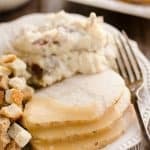 Crock Pot Turkey Breast & Garlic Mashed Potatoes is an easy one pot recipe made in your slow cooker perfect for a small holiday dinner or simple weeknight meal. 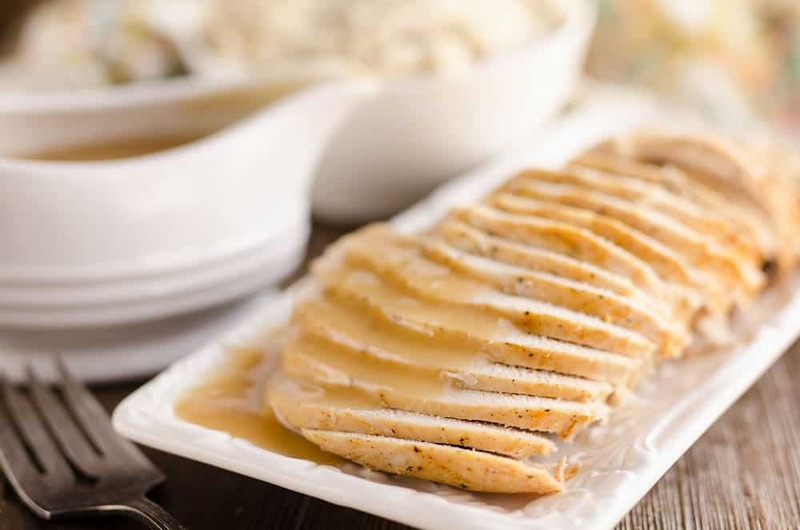 Jennie-O Oven Ready Boneless Turkey Breast, potatoes and gravy come together to make a delicious all-in-one recipe! 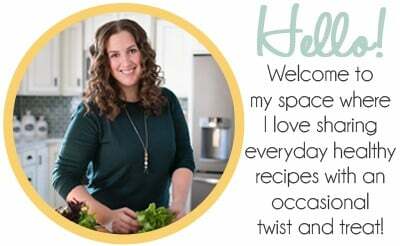 I am excited to be teaming up with Jennie-O to bring you today’s healthy recipe! If you are making a holiday dinner for a small crowd or just your immediate family, you might be looking for an alternative to making a huge turkey. 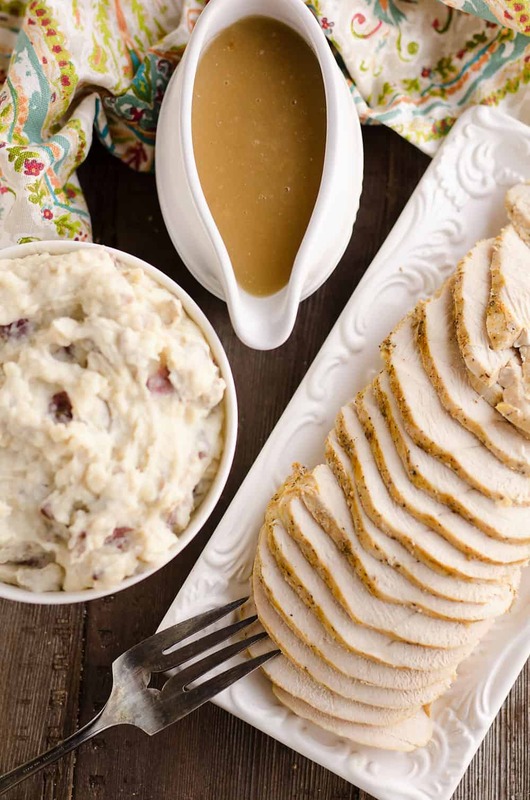 This Crock Pot Turkey Breast & Garlic Mashed Potatoes is just the recipe you need! 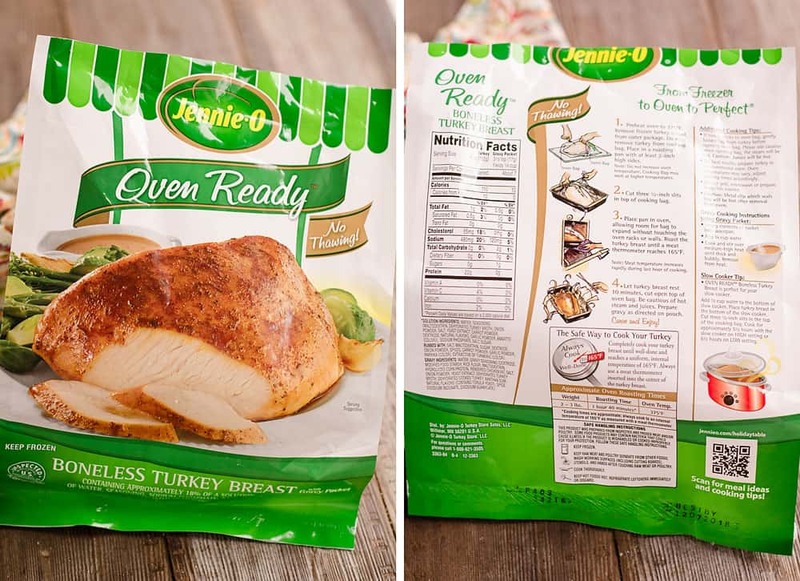 It makes a small 2-3 pound Jennie-O Oven Ready Boneless Turkey Breast and mashed potatoes right in your slow cooker. 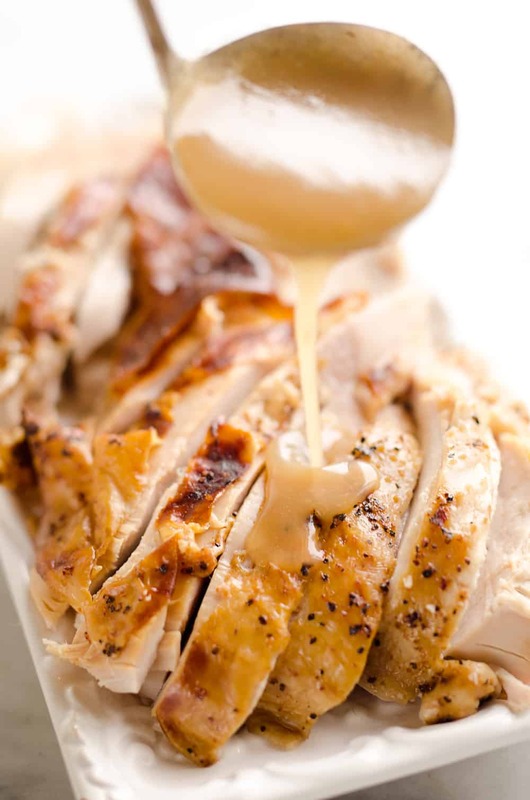 The extra juices are combined with the gravy packet from the Jennie-O turkey to make a quick and delicious gravy. You literally have everything you need for a holiday meal made in one easy recipe and don’t even need to thaw your turkey! These Oven Ready turkeys from Jennie-O are my favorite and now only way I will make turkey anymore. You can take them right from the freezer and pop them in your oven or slow cooker. You don’t have to clear out half of your refrigerator for days to allow it to thaw! They cook up nice and tender with the help of the oven bag that they are packed in and even have a gravy packet included which makes life so easy. To get started making your Crock Pot Turkey Breast & Garlic Mashed Potatoes, spray or line your 5-8 qt slow cooker. Add your choice of Red-skin, Russet or Yukon Gold potatoes, chopped into one inch pieces. Add some garlic and chicken broth to the pot and top with the frozen Jennie-O turkey breast in the oven bag. Pop on the lid and set the Crock Pot to 6 hours on low. When your meal is done cooking, remove the turkey in the oven bag and add any juices from the turkey to a small saucepan. Let the turkey rest on a cutting board so the juices can settle in. Being careful with the hot liner of the Crock Pot, pour off liquid in the pot into the saucepan with the turkey juices. Add the cream cheese, milk, garlic salt and and butter to the potatoes and mash them until smooth. If you use Red-skin potatoes, be careful not to over mash them or they will become gummy with their extra starch. At the end of the day I would prefer a few lumps in my potatoes over gummy potatoes! While you are mashing up your potatoes, put the saucepan of liquid on the stove over high heat. Add the gravy packet from the Jennie-O turkey and let it come to a boil, stirring occasionally. 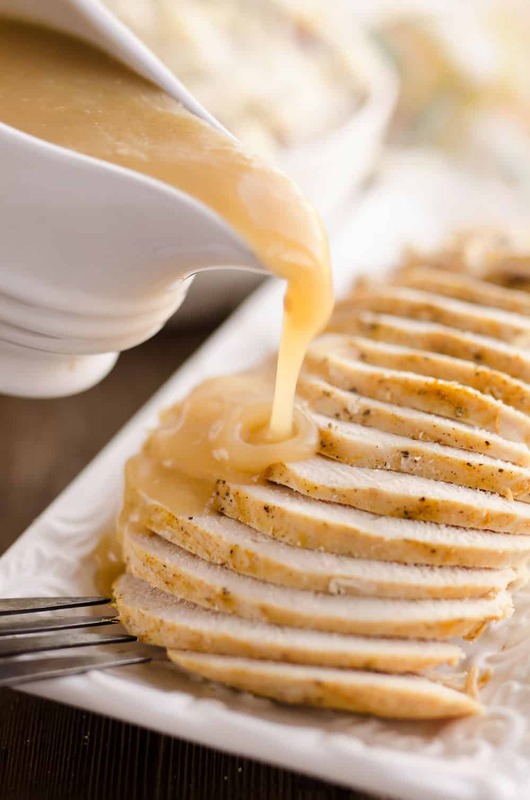 When your gravy is ready, slice up your turkey breast and your meal is ready! This makes for such a great holiday meal when there isn’t a big crowd, but it is also a delicious option for an easy weeknight dinner for your family. Throw everything in the Crock Pot in the morning and just spend an extra 10 minutes before dinner getting it ready. You have got to love when you can set it and forget it! Spray or line your 5-8 qt slow cooker. Chop your potatoes into 1 inch pieces and add them to the slow cooker. Top the potatoes with minced garlic and chicken broth. Nestle the frozen Jennie-O turkey breast in the oven bag into the center of the potatoes. 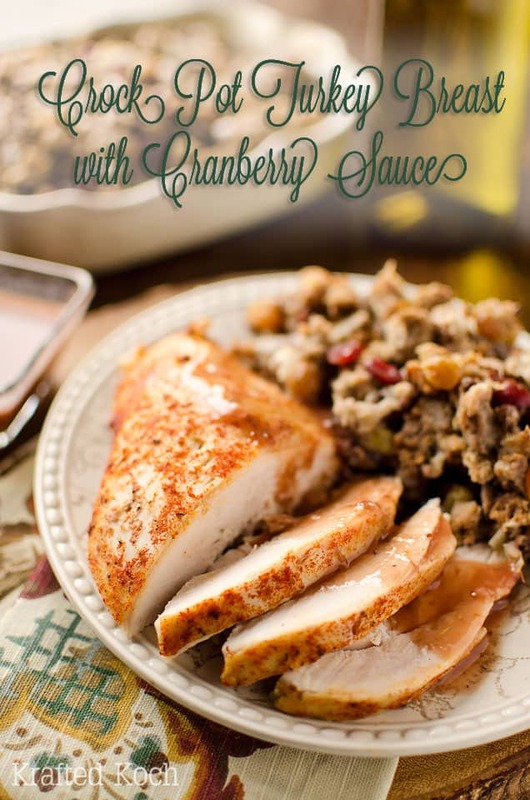 Remove the turkey in the oven bag and add any juices from the turkey bag to a small saucepan. Let the turkey rest on a cutting board so the juices can settle in. Being careful with the hot liner of the Crock Pot, pour off any liquid in the pot into the saucepan with the turkey juices. Add the gravy packet to the juices and cook over high heat until it is bubbling and thickened, stirring occasionally. To the pot of potatoes, add the cream cheese, milk, garlic salt and and butter. Mash the potatoes until smooth, being careful not to over process or they will be gummy. 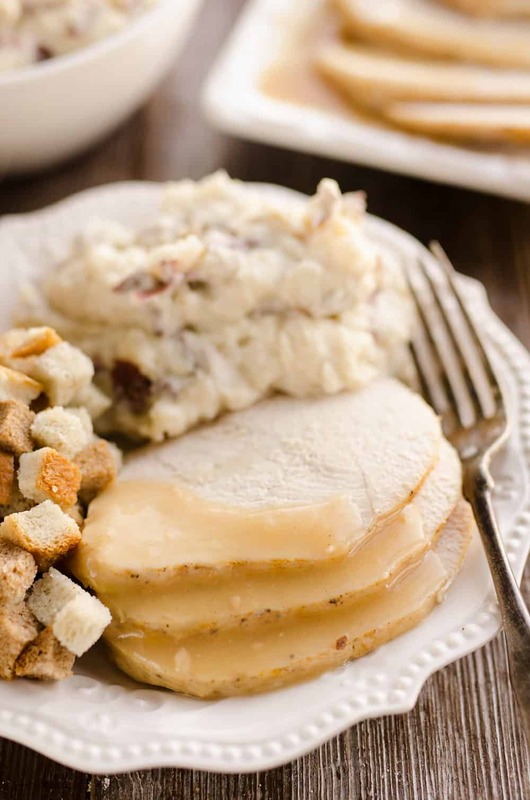 Slice up the turkey breast and serve with the potatoes and gravy. More great turkey recipes for the holidays! Makes my mouth water just looking at the pictures!! What a perfect recipe for a small Thanksgiving crowd! 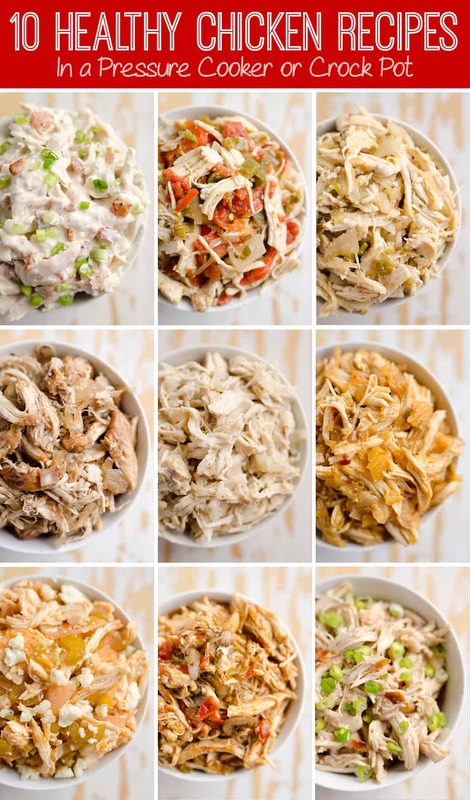 LOVE slow cooker recipes. Pinning!!! OMG, now I can’t wait for Thanksgiving!! Such a great option for a small Thanksgiving! That plate of turkey looks delicious and I love how easy it was all put together. I’ll be making turkey more often! What a great idea to multi-task with the crock pot! I love using the crockpot!! This looks like a wonderful meal! My tummy is growling for this turkey breast and mashed potatoes!! Looks amazing!! !